Hey everybody. I want to write my blog posts as authentic as possible. Therefore every single article is based on real-life experiences from my daily work as a Coach. This time I want to tell you something about bad team setups. In my time as a Coach I often faced the situation to join a team whose members were mixed up randomly by the company. The resulted constellation can be super frustrating because team members weren’t selected according to their skills and context. In this blog post I will explain you the hard consequences of building teams without a plan. Read about the 3 main characters that are absolutely mandatory for a highly innovative and creative team. No Theory! No Fluff! Just Real Life Facts! It’s the dream of every Product Owner, Business Owner or CEO: Highly efficient, innovative and agile teams that are able to learn and act effectively, depending on what the market needs. Nevertheless I believe that the term innovation is heavily misunderstood by a lot of people out there. I had many discussions with CEO’s and Coaches about that thread and my conclusion is that especially the tech-world wrongly assumes that innovation means progress. I would say that innovation is something much more powerful. Innovation is not only a new idea, method or device. It’s more a solution for an unarticulated market need that changes the daily behavior of millions of persons in the world. If you want to come up with a real innovation then you won’t do it alone. Usually you need a strong team and vision in order to pursue your dream. Facebook, Twitter and all these entrepreneur website are showing you the wonderful successful Start-Up world where it seems that innovative products are born every day. What they don’t tell you are the stories and teams who are failing with their great ideas. Despite the fact that many start-ups or teams fail because of bad financing, wrong idea, wrong moment or bad implementation, I believe that a significant amount of innovative ideas are not born due to poor team setups. I want to show you a team model that could help you to realize your innovative dream product. We are all different and everybody of us has a special character, skill, humor appearance and talent! You need all of them! There is a mistake that many organizations are not aware of: They want to develop a new innovative product and they choose the new team members from several other departments in order to rump up the new project. In turn Start-Ups are looking for employees and focus on excellent university degrees. As a result the product will be built by a group that will have a lot of difficulties to navigate and innovate although there are 3 master degrees in one single room. I experienced such teams and I observed that the motivation in lean thinking, pragmatic solutions and openness for failures was almost at zero. There was a high need in perfection and self-presentation that slowed down the entire team and development. The Owner: This character is the one who knows a special technology into its core details. He is a specialist, nerd and always up-to-date with technology. He is absolutely the experienced master in a special area. The Creator: He is the cross-talker in the team. He triggers discussions and is always ready to challenge you with uncomfortable and interesting questions. Many people would say he is disturbing the team and this character is hard to handle. My tip: Give these people a fair chance because they are able to change the idea into a different and unexpected direction. Allow them to raise their voices although it could stress you. Take them serious and analyze their opinion. The Broker: This character knows where he can find special knowledge. He is a connector and is linked to many communities in order to acquire the corresponding information for the team at any time. He is a communicator and an open person. He brings the right people at the right time to the right place. This brings the advantage that your team members talk with persons they would never talk to. Now I will explain you what magic results you can create if you have these 3 characters in one team. The interesting detail is that ONE of the above mentioned characters is not able to innovate alone. (If you have a different opinion on that, add your thoughts in the comments below). From my experience the Owner is good in his technological area but this is not enough to create a disruptive market solution. The broker definitely needs co-workers and the Creator is too wild and distracted in order to come up with an unique solution for a huge market. The conclusion is that you need to combine all of them. Owner + Broker = Evaluation: Both of them are good in evaluating. The broker knows how to evaluate the acquired knowledge. In turn the Owner also needs to evaluate if the technology and his knowledge can solve the problem of the broker. Evaluation is what the limbic system of our brain does all the time. 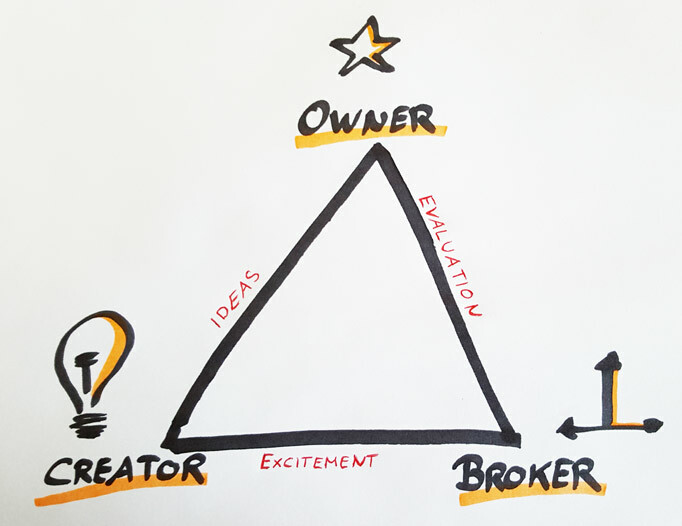 Broker + Creator = Stimulation: Broker and Creators have disturbing characteristics that will lead to stimulation and excitement in the team. Creator + Owner = Ideas: If you connect these characters you combine knowledge and instability. This will create a huge pool of excellent and crazy ideas. If you re-check this model on your team and realize that you only have owners or creators then you might be screwed. Such team constellation will reflect directly on your average product. It’s one of the biggest lies in the world that an “only-expert” team will lead you to success. If you don’t see this model reflecting on your team then you should consider a change because otherwise you are running a quite huge risk as you might be responsible for a budget. Actually I don’t like the term, BUT sometimes it’s good to “re-organize” and focus the right people on the right product. If you have the chance to create a team from scratch, then you know what you should pay attention to: Identify the 3 mentioned characters and bring them together. Then you have a much higher opportunity to create a very great and innovative product that can really disrupt the market. The truth is that you’re not the only person concerned about that thread. Especially in the tech-world the team-mix-up culture is like an illness. Team members and product owners get sick and tired of bad team constellations. So stop choosing candidates randomly and start analyzing these 3 mandatory characters in your organization or hiring process! What’s your opinion? 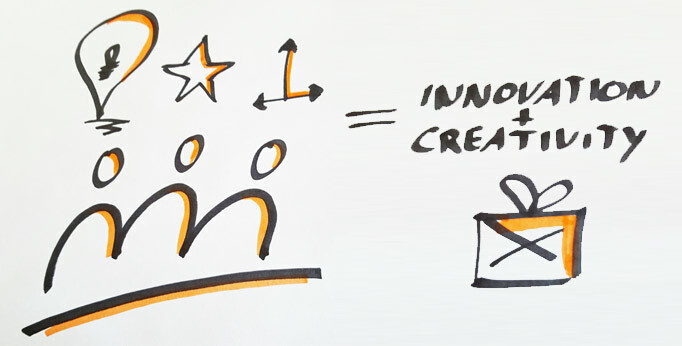 Is your team really innovative? Can you identify all of these characters in your team? Do you disagree? Don’t hesitate to drop your comments below. I will answer all of them! Thank you very in advance!